If you are into the habit, like me, of making your own home made corn tortillas, a tortilla press comes in really handy. It’s true that tortillas can be made in many different ways such as simply flattening round corn masa or dough balls with your hands or rolling out the masa with a rolling pin. However, the tortilla press makes the process be a speedy, consistent, fun and even therapeutic one (it is!). Moreover, look at what a pretty tool it is. 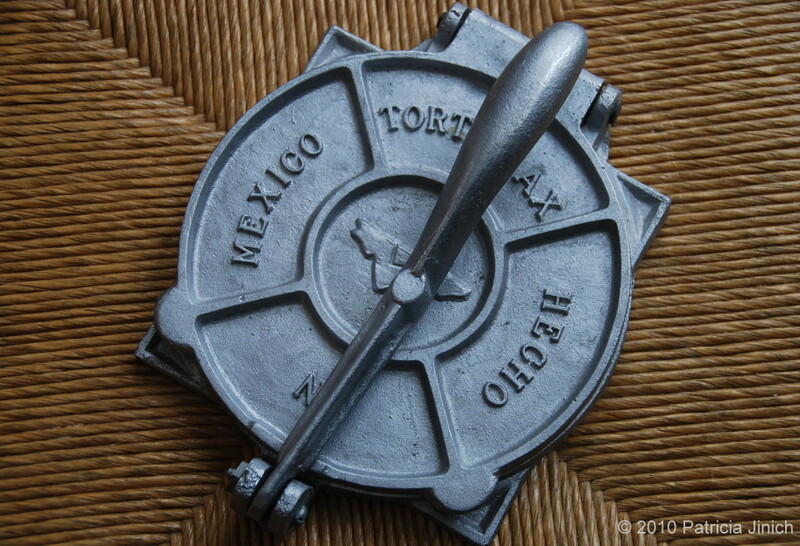 Here is what a tortilla press looks like when closed. Sitting on my chair. Mine is cast iron, but you can also find aluminum and wooden ones. I prefer cast iron, but don’t mind aluminum as long as it is heavy and sturdy. I find the wooden ones a bit tricky to use. This is what one looks open, ready for you to use. As you see, there are some pieces of plastic cut in rounds -from produce bags is perfect. 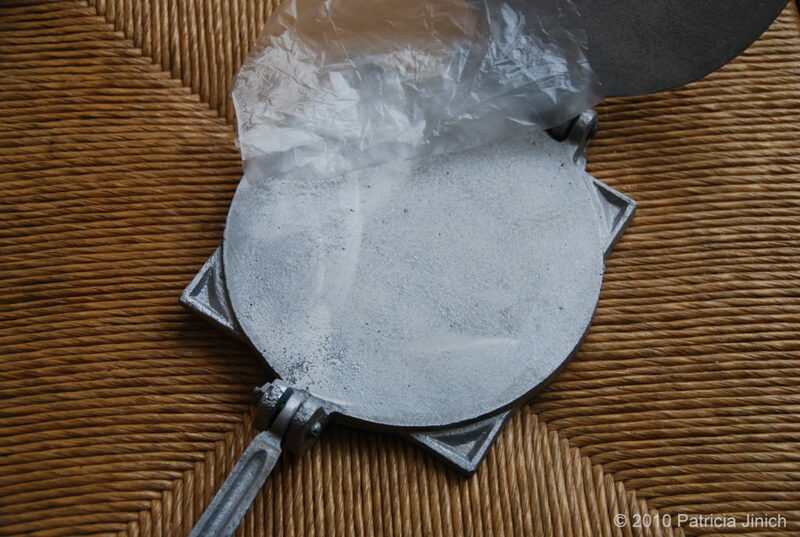 A plastic round is placed in the bottom of the opened press, so you can place a corn dough or masa ball, top with another plastic round and then simply close the press, and press it down. Where did you find that tortilla press from Mexico? I would like to find out just like that. I will check out our local Mexican Market. Oh I found it in a local market in Mexico…but I’m sure you can find one at your local market as well, Ernie. I would love to see you make your own brand (PATI) of cookware dinner plates service plates of Mexican style. There are so many other styles American Italian French, but when you go into a standard store you never find Mexican-style and they’re beautiful , I would love to see your name as a contributing factor to that style of cookware. Thank you for the suggestion…hopefully soon. You know? That is a funny thing that tortilla presses seem to do and it is part of their personality. All of them seem to squash one side more than the other, to fix this, I jiggle the press a little when I press down, and also, I flip the tortilla once during the pressing process, so I press them twice. Once not all the way and the second one a bit deeper. Hi Pati! I would like to ask you where to purchase the tortilla press you show on your web site, thanks! Just had to tell you that your Chicken Tinga is a big hit in my home. My family said “put it on the list”…meaning those foods that are fantastic and want me to make again soon. Thank you for making your shows easy to follow and exciting and non-threatening to attempt to make at home. I’m even going to start making my own tortillas! You’re the best! Hola Terri, I’m sooo thrilled my tinga recipe made your families list!! It will go great with those homemade tortillas! Howdy Patti, I enjoy every recipe you make Can’t wait to try them. Just wondering do you know how the enchilada sauce is made here in Central Texas. I guess it would be called maybe TEX-Mex enchilada sauce. I have tried and tried to reproduce it with no luck. Any suggestions? I know it is tomato base but not sure what kinds of spices they use and how it is made. Thanks Patti. I will make a trip to Panam, sounds like an interesting store! Thanks also for the invaluable tip on sopes and chalupas. I often make your Avocado soup, so simple and delicious, which you demonstrated at an event I attended. I live in MD near DC border. Where can I get an excellent tortilla press. I had one before but it did not give me uniformly thick tortillas. Is there a shop I can purchase it from or only through internet? Another question, how to regulate the shape and thickness as in chalupas and sopes that you mention. Have you tried a Latino store, like Panam? Or online too… The trick with tortilla presses is: you have to jiggle it a little as you are pressing down! Give that a try. As far as chalupas and sopes, they should be at least 2 times as thick as corn tortillas, sometimes even three times. Much like a thin pancake… then you pinch the edges before it cools down. Pati my Mom and I watch you show all the time (when it is on our PBS station). My Mom is on a very low sodium diet so I am learning to make flour tortillas (her favorite). Rolling with a rolling pin takes a lot of energy so I am considering a tortilla press. What I have read is that on the cast iron ones the handles often snap – I thought I remember you saying the cast iron ones were the best. Any guidance you can provide would be greatly appreciate. We love your recipes even if we have to leave out the salt!!!! Pati, I love your show. I love the food of Northern Mexico! You are the best! Eres muy lindo Pati y tienes corazon de oro..es claro. I just caught your show. Fantastic! Your website, even better. Thank you for the great recipes. I have been searching for a good resource and have tried a few recipes. Needless to say they are simply wonderful. Reminiscent of my abuelas cooking. I am curious. Do you have a good flour tortilla recipe? Mole for enchiladas? I have struggled to find great recipes. I love your show and I love you. You are hotter than any of your recipes and your smile makes me smile. My friends think I’m a mexican culinary genious. I think it’s time I share my secret with them. Your anaise cookies are a hit. Times are tough but now I can make so much for so little. Thank you so much!!! Thank you create!!! Please keep this show. PS. I would like to see something coastal. I love shrimp!!! I think it might hit the spot! I use a one gallon ziplock freezer bag with the zipped cut off with scissors and slpit down both side seam’s. Leave the bottom connected to both sides to act as a hinge. Works great in the tortilla press and I also have used a small cast iron skillet right on the table top to press the masa ball into tortillas right on the table top. My skillet has a Fire/Heat ring on bottom which gives perfect thickness. Plastic is heavy enough to be used many times and even washed and stored for later use. Love your blog! This is my first time to leave a comment. I’m researching “industrial” tortilla presses for a small business opportunity. I hope to make preservative free tortillas from organic flour to be sold in a bakery. Do you have suggestions of what I should look for/stay away from in tortilla presses? Have you had any experience with the manually operated larger scale tortilla makers? Are there any brands that you suggest? I was looking at a DoughPro 2000 and a DoughXpress but there’s a fairly big difference in price. Would love to have your opinion on this! Thank you so much!! Welcome and please come by anytime! Debra, it is great news that you are making fresh tortillas with no preservatives. Those are so hard to find in the stores. Impossible. I am sure you will have so many people wanting to get them!